I am here to witness the many powers of social media. On Sept. 3, a dear friend from college posted this picture on his Facebook wall. Insert the picture of MANY quarts of tomatoes I was not only impressed, I was inspired. 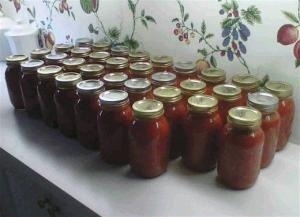 It brought back memories of my grandmother (the one who lived next door to us) along with my mother and her two sisters (who lived on the other side and across the street from us) canning tomatoes every fall. The smell of the tomato puree cooking down on the stove in the full kitchen in our basement is still etched in my memory. Didn’t all houses have two kitchens? All of the Italian-American families I knew did! The memory of all of the women wearing their little jacket/vest aprons (I think my mother kept one in her purse) washing the fruit, running it through the food mill, washing the bottles, stirring the pot, speaking in Italian (when they didn’t want us to know what they were saying) and the sight of Tom and Mary’s 34 quarts of tomatoes convinced me it was time to give canning a try. I started out looking up recipes online and consulting my old “Joy of Cooking” cookbook I received when I got married. On Sunday, the 11th of September, I went to the farmers market and bought 16 quarts of tomatoes (seems like a lot but looks definitely do deceive in this case) and along with some tomatoes I had at home I had about 18 quarts. 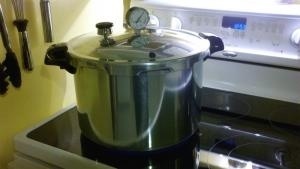 I searched high and low in Erie and Niagara County and had to drive to Batavia to purchase a pressure canner/cooker. 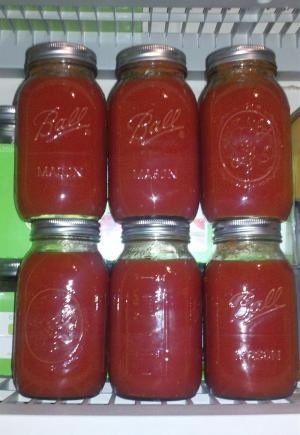 By the time I got home there was no canning that would happen that day. I had a hard deadline of Saturday the 17th to complete the task as I was leaving for an 8-hour drive to New Jersey. On Thursday the 15th I washed, blanched and processed these 18 quarts of tomatoes through a food mill (this removed the skin and seeds). The thought of losing these tomatoes to rot was a huge incentive to push forward. On Friday, I intended to leave work early (I kid only myself), cook down the puree and pressure can. Not so fast! Puree takes a very long time to cook down. Hours and hours of stirring and measuring with a wooden spoon was raising the pressure in my head and the intimidation of learning how to use a pressure cooker made me wish I had a release valve. The time in this picture above says 12:53. That is a.m. There was not a lot of sleep gotten before the long ride only hours away. I washed the seven-quart bottles (because that was the maximum number my canner would hold) in hopes I would fill most of them. I filled six-quart bottles and painstakingly followed the instructions that came with this huge pot. I put three quarts of water in the canner, clamped the lid and let’er’rip. Wow, a pressure cooker makes a lot of noise. At the end, when things literally quieted down, I ended up with six quarts of lovingly made tomato puree. Would I do it again? Absolutely, only next time I need my mother and my sister to help. Do you can? Tell me what you “put up” each year and let me know some secrets. I’ll let you know what I hear from all of you.